The main character is so likable and true to herself. Starts from her appearance, and then her attitude, and how she acts. She's unique, and yet far from perfect. She says what she wants to say, but she still thinks before she says it (well, most of the time). She might be annoying at first, if you're not used to her narration, but then she would grow on you. Unlike Anna, I found out that I truly cared about this girl. I liked her creativity, her uniqueness, her it's-my-life-not-yours-but-thank-you-for-interfering attitude. Even though she's confused about her relationship between her boyfriend and Cricket, I found it believable and totally relatable. I mean, who wouldn't get confused if you already have a boyfriend yet there's a totally sweet and cute guy who lives next door to you? Heck, I would be hella confused about my priorities. The love interest, Cricket, is a guy any girl could ever dream of. Seriously, who wouldn't want a guy who can make basically everything with his hands and has good sense in fashion? Not only that, he's like another version of Joe Fontaine from The Sky Is Everywhere, all smiles and sunny attitude, just without the musical genius thing. He's also the kind of guy you would totally want to introduce to your friends and family. Why? Because he has the charm. He has a way of making people like him in the first meeting. And heck. He's also gorgeous and tall (unlike St. Clair). The romance is so cute and sweet. If cotton candy and chocolate chip cookies ever make babies, this is it. Let's face it. 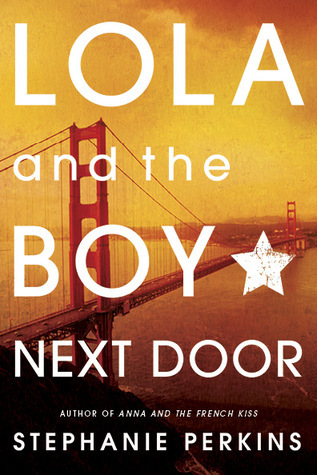 The story is about Lola and the boy who lives next door to her. In other words, her neighbor, in other words, the person she's known her own life, in other words, CHILDHOOD FRIENDS!!! Oh god, I'm a total sucker for that. Ever since I've watched Flipped, I just couldn't help but ship two childhood friends/neighbors together. Even though they have bad past, or don't particularly like each other (*cough* The Heir *cough*), if they've known each other their whole lives, I'm in. And yeah. If you like the same thing, then this book is perfect for you. Seriously, even if you hated Anna, you totally should read this. The family portrayal is so interesting and adorable! Lola has gay parents! How interesting is that! I haven't read any book that has two dads in it , but I have to admit, I enjoyed this one. She was raised in an unusual environment. Maybe that's why she becomes the unusual person she is. I love how her parents care so much about her. I admit, having two protective dads instead of one must be pretty exhausting. Her parents are two different people. They love her so much, but they show it in different ways. I found it adorable how they all complete each other. While in Anna and The French Kiss we don't really get to see any of the characters' family that much, we do get so much in here. And that's the more reason to like it. Unfortunately, the plot is predictable and pretty much like Anna and The French Kiss. Yes. It's predictable. And yes, one of the main characters is in a relationship. But, still, I liked it. I'm not sure why. Maybe because Lola is way better than Anna or maybe because her narration isn't a bit annoying like Anna's. But in the end, even though it's predictable and just a reversed version of Anna's love story, I still found myself liking it. One thing that I didn't get was why the name CRICKET?? Seriously! I mean, I would NEVER name my child after an insect! What if he got insulted at preschool? What if he got mocked by the boyfriend of the girl he likes? I know you were probably trying to be creative, Steph, but please, consider a more normal name. Considerably less insect-y and less weird. In all, I have to say that this book is by far my favorite in the series. Anna was *vomits* while this was full of rainbows and unicorns. I was definitely expecting something better because Mel recommended me to read this one. And boy was I not disappointed! After reading *vomits* and *farts* in Anna and The French Kiss, Lola was a total paradise. I'm recommending this book to all contemporary readers out there, and you! Yes, you! Even though maybe you hated Anna, you should definitely read this book!